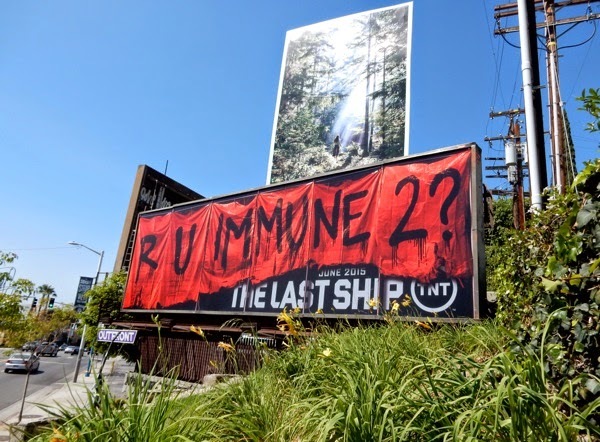 Last Summer apocalyptic contagions were all the rage, whether it was the vampiric worms attacking the inhabitants of New York City in The Strain, or a worldwide pandemic wiping out 80% of humanity in The Last Ship. 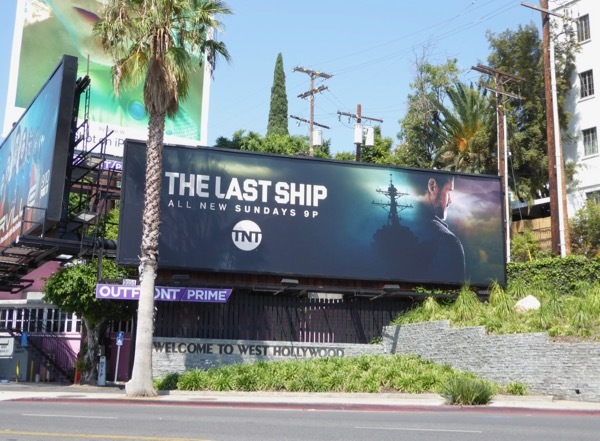 In their debut season Eric Dane and his U.S. Navy crew of the lone unaffected destroyer, USS Nathan James, helped Rhona Mitra's scientist find and develop a cure for the virus plaguing the Earth's remaining population. 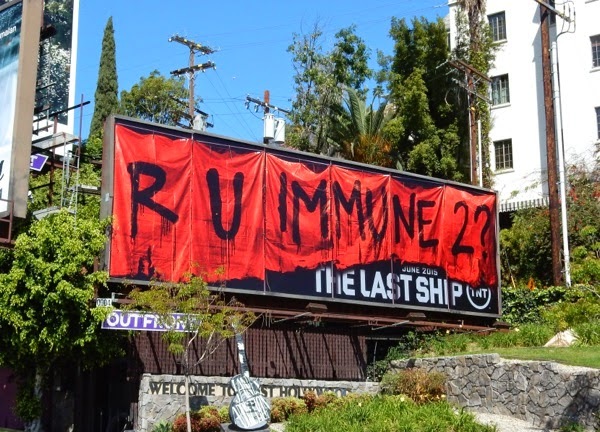 In their quest for a cure to the global crisis they made some allies and more than a few enemies along the way, and just when they thought things were going their way they were betrayed by their own countrymen in the season finale with many of the crew's fates left up in the air. 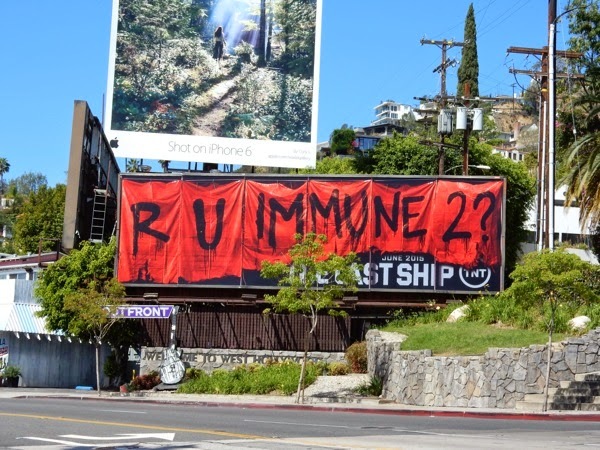 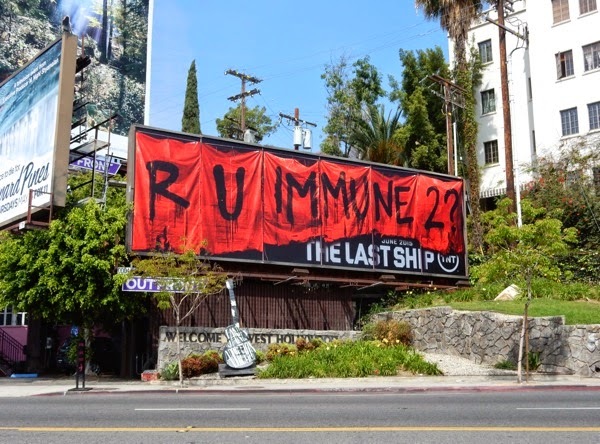 This cool season two 'R U Immune 2' billboard was first spied along Sunset Boulevard in West Hollywood on March 31 to tease the forthcoming new episodes, whilst the 'girl and gas mask' ad creative was snapped on April 29, 2015. 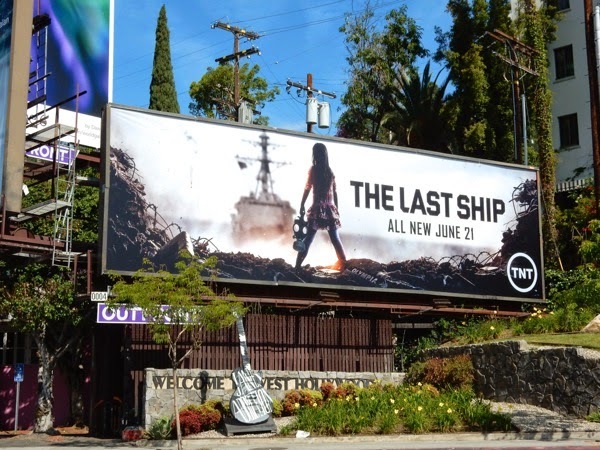 The Last Ship got off to a great start in its inaugural year, so let's hope the series can maintain the momentum and build on its unique mix of action and sci-fi in its continuing voyages. 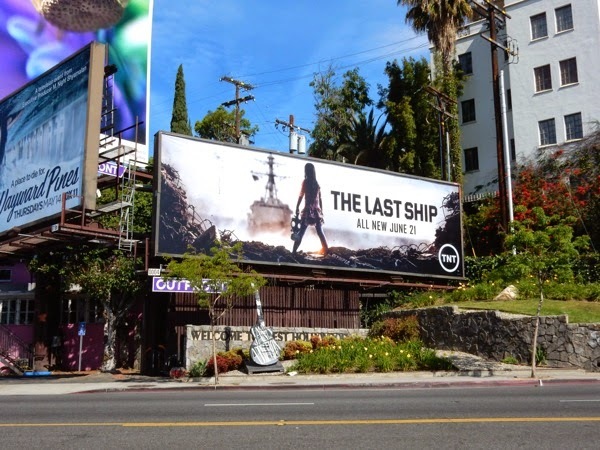 If you're a fan of the post-apocalyptic Naval drama, be sure to also check out these season one billboards for The Last Ship. 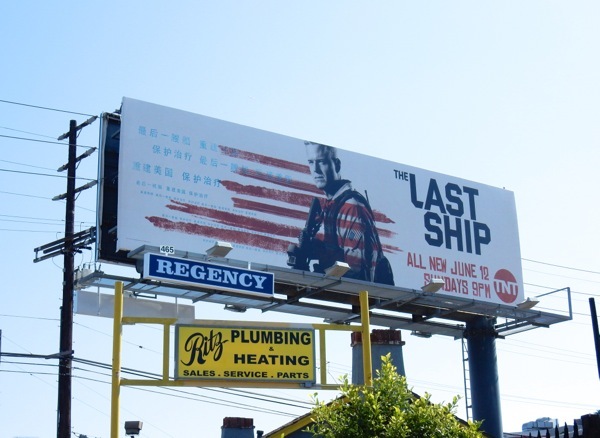 UPDATED: Here's also the third season billboard which hints at new threats on shore and on the high seas for the crew of The Last Ship, and was snapped along La Brea Avenue on May 26, 2016. 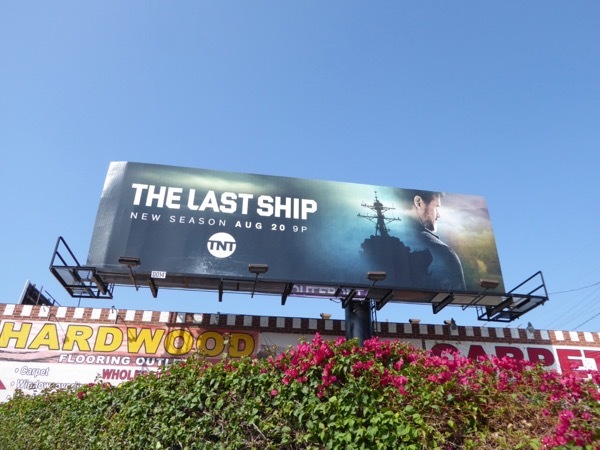 UPDATED: It may no longer be The Last Ship in the fleet, but that doesn't stop the show and the crew of the fictional USS Nathan James returning for a fourth season to help save the world, with this billboard spotted along La Cienega Boulevard on August 25, 2017. 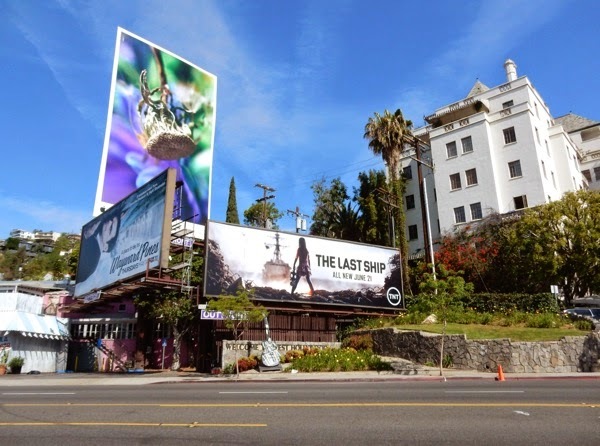 And here's another billboard example spied along West Hollywood's Sunset Strip on September 1, 2017.